PLEASE NOTE: Our STEM Field Trips are temporarily on hold. Please check back for updates! Rollerland Skate Center wants to encourage children in the Fort Collins area to investigate their passions for science and math! 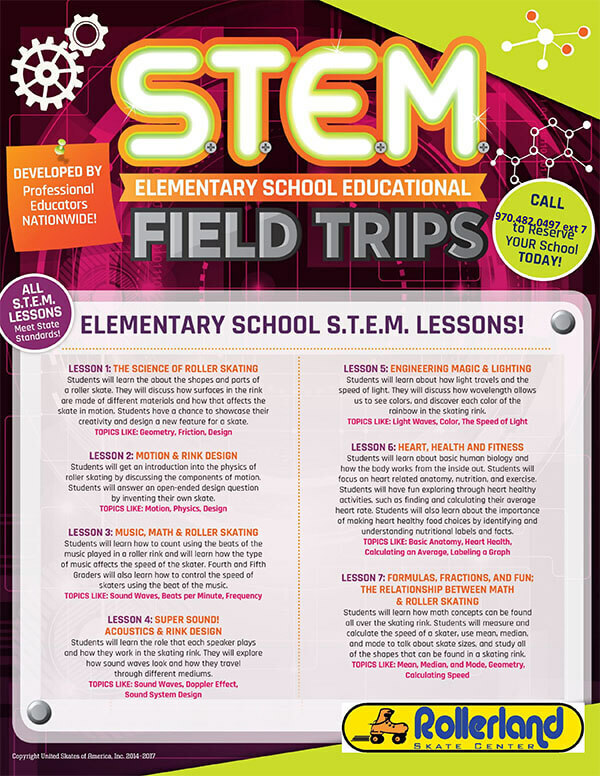 Learn more about encouraging kids to value innovation and education with STEM field trips for Fort Collins area schools. STEM disciplines are an integral part of all of kids’ favorite activities. By showing them how things like eating, creating, and roller-skating tie into science, technology, engineering, and math, we can engage their minds and encourage kids’ passion for learning. Rollerland partners with Fort Collins area teachers to show kids real world applications of the concepts they learn in the classroom. We have multiple lesson plans to choose from, giving teachers a chance to tie-in daily education with a fun lesson that will make it stick. After all, there’s nothing better than getting kids excited about learning! Transform the way your students see STEM. 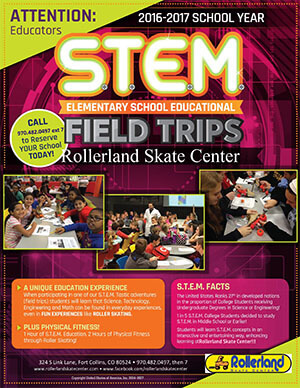 Get kids excited about science, technology, engineering, and math with a STEM field trip at Rollerland.